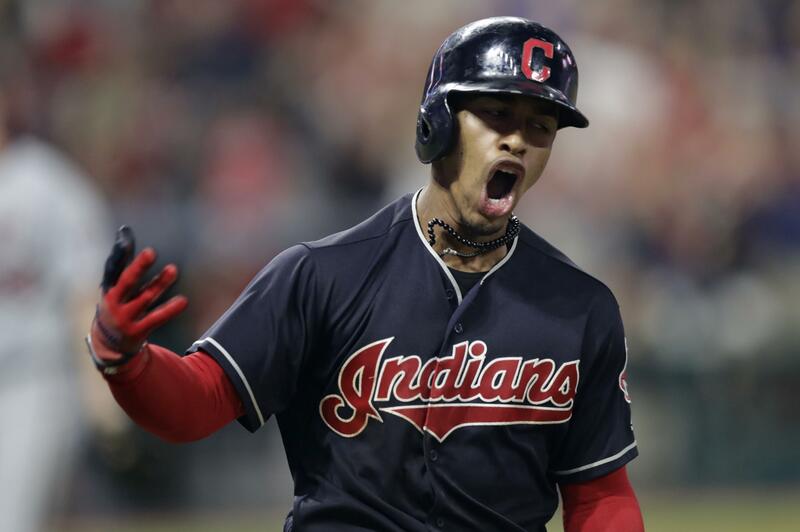 Wed., Aug. 8, 2018, 11:01 p.m.
CLEVELAND – Francisco Lindor connected for a three-run homer with two outs in the ninth inning as the Cleveland Indians again moved 10 games ahead of Minnesota in the AL Central with a 5-2 win over the Twins on Wednesday night. Lindor, who struck out with the winning run at second base in the ninth in a loss on Tuesday, drove the first pitch from Trevor Hildenberger (2-3) over the wall in right to trigger a wild celebration. Jason Kipnis singled with one out in the ninth before Twins right fielder Max Kepler robbed Yan Gomes of extra bases with a leaping catch before crashing into the wall. Brandon Guyer followed with a single to bring up Lindor, who capped a wild ninth inning with his 29th homer. The All-Star shortstop skipped around the bases before being mobbed at home plate by his teammates. Down 2-1, Minnesota tied it in the ninth on Miguel Sano’s leadoff homer against Cody Allen (4-4), who wound up with a blown save and win. DIAMONDBACKS 6, PHILLIES 0: At Phoenix, Patrick Corbin struck out nine in a combined four-hitter, David Peralta had four hits and two RBIs, and the Arizona Diamondbacks rolled over the Philadelphia Phillies 6-0 on Wednesday. Corbin (10-4) had the Phillies guessing most of the game, allowing four hits in 7 1/3 innings while reaching a career-high 183 strikeouts this season. The left-hander did not give up a home run for the ninth straight start, the longest stretch by an Arizoba Diamondbacks pitcher since Brandon Webb in 2003. Peralta hit a two-run triple off Vince Velasquez (8-9) in the third inning, sending the Phillies right-hander to his first loss since June 25. Peralta had his fourth four-hit game of the homestand and tied the franchise record with 10 hits in the three-game series. He is 18 for 31 since taking two days off with shoulder tightness last week. Eduardo Escobar had three RBIs for the NL West-leading Diamondbacks. BRAVES 8, NATIONALS 3: At Washington, Ronald Acuna Jr. hit one of Atlanta’s three homers, then took away a long ball from Washington to back Mike Foltynewicz (9-7). Charlie Culberson and Tyler Flowers also went deep for the Braves. Culberson hit a three-run drive off Tommy Milone (1-1) in the second inning, and it was 7-1 by the fourth. Culberson has homered in three straight games. Acuna also made a sensational catch in the fourth inning to rob Matt Adams of a home run. Acuna raced to the center-field wall, leaped and snagged the ball with his outstretched glove before sprawling on the warning track. Bryce Harper hit his 28th home run for the Nationals, who showed their frustration in the sixth inning when rookie Juan Soto and hitting coach Kevin Long were ejected by home plate umpire Greg Gibson. ATHLETICS 3, DODGERS 2: At Oakland, California, Newly acquired Mike Fiers pitched 5 1/3 strong innings and the Athletics beat the Dodgers. The A’s broke a 2-2 in the eighth inning when Khris Davis hit a fielder’s choice grounder off Dodgers reliever J.T. Chargois (2-3), scoring Marcus Semien from third. Dodgers third baseman Manny Machado fielded Davis’ bouncer and fired home to catcher Yasmani Grandal, but Grandal never had control of the ball when he swipe-tagged Semien. Grandal was charged with an error on the play. Semien singled leading off the inning. He almost got doubled off first on Matt Chapman’s fly ball to Cody Bellinger in center. His throw was off-line throw back to first. Jed Lowrie followed with a hit that sent Semien to third. Jeurys Familia (3-0) pitched a scoreless eighth for the win and Blake Treinen worked the ninth for his 29th save in 33 chances. METS 8, REDS 0: At New York, Jacob deGrom struck out 10 in six innings, received rare significant run support and earned his first win in nearly two months as New York beat Cincinnati. DeGrom (6-7) ended a seven-start winless streak, allowing four hits in a 100-pitch outing and lowering his major league-leading ERA to 1.77. He won for the first time since June 18 at Colorado. Brandon Nimmo tied a team record with three doubles and drove in three runs to help the Mets win for the 22nd time in their last 66 games. Austin Jackson drove in two runs with a double in the second and a single in the fifth as the Mets built a 5-0 lead. Nimmo hit an RBI double in the fifth and scored on a sacrifice fly by Amed Rosario in the fourth. Nimmo had a two-run double in the eighth. Robert Stephenson (0-1) was the loser. CARDINALS 7, MARLINS 1: At Miami, Matt Carpenter hit a tiebreaking homer for the second consecutive night, and St. Louis won its fourth series in a row by beating Miami. Carpenter put St. Louis ahead with a home run leading off the sixth inning, his NL-leading 31st. The Cardinals’ Yadier Molina hit his 15th homer in the first and doubled home two runs in the ninth. Marcell Ozuna doubled home a run in the sixth and went 6 for 11 in the series against his former team. Trevor Richards (3-7) allowed three runs in 5 2/3 innings for the last-place Marlins. RANGERS 11, MARINERS 7: At Arlington, Texas, Joey Gallo homered twice and drove in four runs, Yovani Gallardo won his fourth straight start and Texas held off Seattle. Gallardo (7-1) leads the majors with seven wins since June 23. He allowed three hits, two runs and three walks while striking out two in six innings. Gallo has hit 10 of his 31 homers in his past 19 games. He went 3 for 5 to raise his batting average above .200 for the first time since June 16. Seattle starter Marco Gonzales (12-7) gave up career highs of 12 hits and seven runs in five innings. Gallo’s homers against Gonzales gave him 12 against left-handers this season, the most by a Texas left-handed batter since Rafael Palmeiro hit 15 in 2003. Mike Zunino hit two homers for the Mariners. BREWERS 8, PADRES 4: At Milwaukee, Jesus Aguilar, Travis Shaw and Eric Thames hit consecutive first-inning homers to spoil the debut of San Diego’s Brett Kennedy. Kennedy (0-1), who was 10-0 in 16 starts at Triple-A El Paso before being called up Monday, was tagged for six runs on 11 hits in four innings. Orlando Arcia and Christian Yelich also homered for Milwaukee, while Hunter Renfroe had a two-run shot for San Diego. Jhoulys Chacin (11-4) allowed three runs on six hits in six innings to win for the fifth time in six decisions. RED SOX 10, BLUE JAYS 5: At Toronto, Rafael Devers returned from the disabled list and hit a two-run home run, Brian Johnson pitched a season-high seven innings to win his second straight start and Boston extended its winning streak to six games. J.D. Martinez had three hits and Xander Bogaerts had three RBIs for the AL East-leading Red Sox. Boston chased Blue Jays starter Mike Hauschild (1-1) with a four-run third inning. YANKEES 7, WHITE SOX 3: At Chicago, Luis Severino pitched seven effective innings in his first win in a month, Giancarlo Stanton hit his first grand slam in four years and New York finished a sweep of Chicago. Aaron Hicks also homered as wild card-leading New York closed out a 3-4 trip with its third consecutive win. Gleyber Torres reached three times on a single and two walks. Severino (15-5) retired 11 in a row after the White Sox used three straight hits to open a 2-0 lead in the first. White Sox right-hander Lucas Giolito (7-9) was tagged for seven runs and six hits in five innings in his first loss in a month. PIRATES 4, ROCKIES 3: At Denver, Adam Frazier had three hits and made a run-saving play in the field in Pittsburgh’s victory over Colorado. Frazier had two doubles and a single, but made what might have been his biggest contribution in the field. With runners on the corners and two outs in the eighth inning, pinch-hitter Chris Iannetta hit a sharp grounder to the hole at second. Frazier made a diving stop and threw out Iannetta to end the inning and preserve the one-run lead. Chris Archer (4-5) allowed two runs and five hits in five innings in his second start since being acquired from Tampa Bay. Jan Vazquez got four out for his 26th save. German Marquez (9-9) tied a career high with 10 strikeouts, and David Dahl homered for the Rockies. ANGELS 6, TIGERS 0: At Anaheim, California, Justin Upton and Albert Pujols hit back-to-back homers in the fifth inning, and Los Angeles completed a three-game sweep of Detroit. Kole Calhoun hit a leadoff homer and rookie Jaime Barria (7-7) pitched five-hit ball into the sixth. Los Angeles was in a 1-6 skid before getting back to .500 in the series with the struggling Tigers. Upton connected on a full-count changeup from Blaine Hardy (4-4) for a two-run homer shortly before Pujols added his 632nd career homer. Mike Trout missed his seventh consecutive game with a sore right wrist, but the Angels are hopeful the two-time AL MVP can return against Oakland this weekend. ROYALS 9, CUBS 0: At Kansas City, Missouri, Heath Fillmyer allowed three singles over seven innings for his first major league win, Adalberto Mondesi and Drew Butera each drove in three, and Kansas City beat Chicago. Anthony Rizzo drilled Fillmyer (1-1) with a line drive on the left foot on his third pitch, but Fillmyer stuck around and didn’t allow another hit until David Bote and Tommy La Stella singled with one out in the seventh inning. Jose Quintana (10-8) dropped to 3-10 in 25 starts against the Royals. He was removed after Mondesi’s homer, giving up five runs on six hits and two walks. ORIOLES 5, RAYS 4: At St. Petersburg, Florida, Trey Mancini hit a go-ahead two-run double in the ninth inning, and Baltimore beat Tampa Bay despite committing five errors. It was the first time the Orioles committed five errors in a victory since June 9, 1983. Sergio Romo (2-3) allowed consecutive hits to Mark Trumbo, Danny Valencia and Mancini in the ninth, the only three batters he faced. It was Romo’s seventh blown save. Tampa Bay has played five straight one-run games and lost four of them. Mike Wright Jr. (3-0) got two outs in relief, and Mychal Givens pitched the ninth for his third save. Published: Aug. 8, 2018, 11:01 p.m.